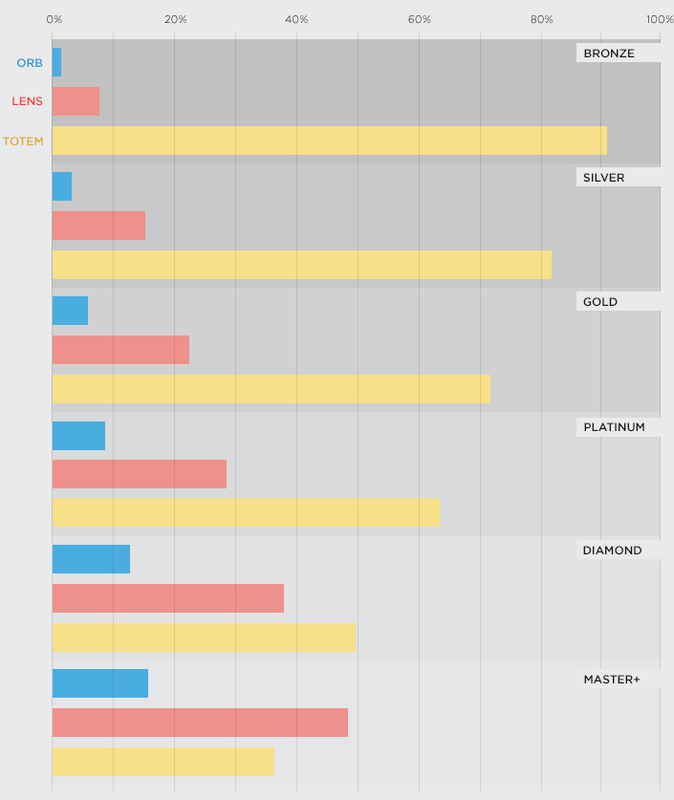 The millions of players around the world that play League of Legends generate lots of data. If you visit sites that provide champion win rates and summaries, you are seeing a slice of this data in action. As a member of Insights at Riot, I help distill this raw data into digestible information that can be used to improve League of Legends. This is the first part of a recurring series on data for data’s sake, called Clairvoyance. Wards are a curious thing. Despite not providing any combat stats, they’re incredibly powerful. Wards provide vision, vision is information, and information is power. Warding allows you to take fewer risks: less face-checking, getting ganked, and throwing at Baron. So, wards are good, but how often do typical players buy them? 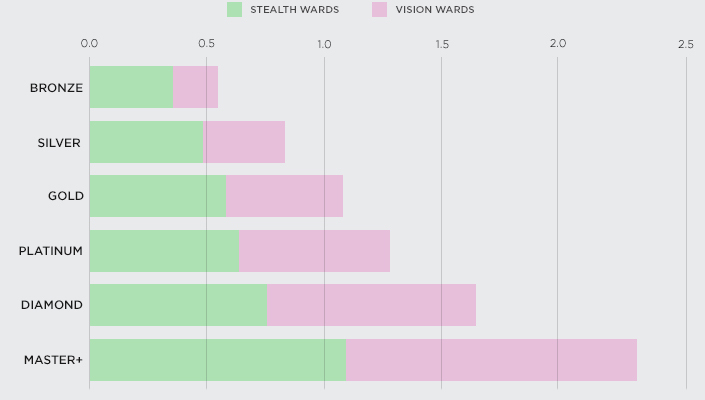 Throughout the course of a game, the average player purchases 0.9 wards, which we define here as either a Stealth Ward or a Vision Ward. However, that figure is heavily skewed by the few selfless heroes buying multiple wards. 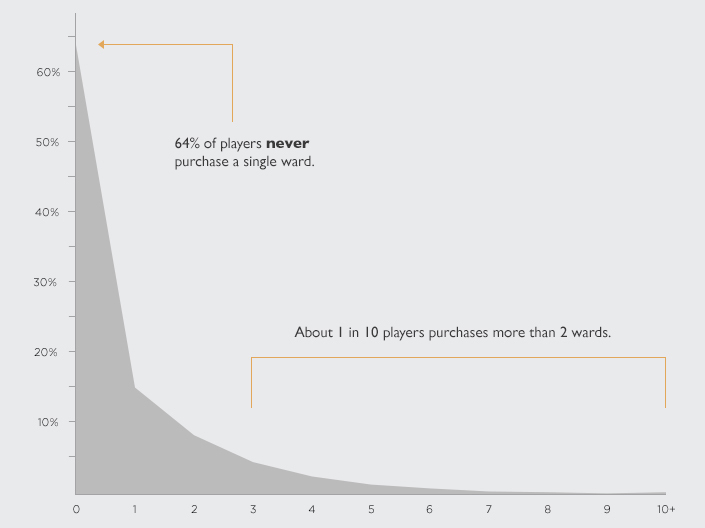 The majority of players, 64%, never purchase a single ward, and only about one in ten purchases more than two. Who’s buying, or not buying, wards? It’s not surprising that ward purchases vary across role. ADCs buy the fewest wards, averaging 0.3 wards per game, while Supports lead the pack with 1.8 wards per game. That figure doesn’t include Sightstone, which predominantly lends to support itemization. Before you yell at your team’s Vayne, keep in mind that it makes sense for some roles to purchase more wards than others. Supports, for example, don’t scale with items as well as other roles and typically invest more of their gold into team-centric items like wards. Junglers are more likely to roam the map and have the opportunity to ward strategic spots. On the other hand, Top Laners are often isolated from midgame objective control, which depends heavily on wards, and might spend more of their gold on dueling items. With that said, most players could probably afford to ward more. Let’s take a look at warding patterns across different levels of play. Players in Bronze buy just shy of 0.6 wards per game, while players in Master and Challenger buy roughly four times as many. The upward trend is especially strong for Vision Wards, with the typical Bronze player buying less than 0.2 per game and the typical Master+ player buying over 1.2 per game. Disclaimer: while there is likely a causal link between your vision game and your ranking, doubling your ward purchases probably won’t suddenly bump you from Silver to Diamond. These trends show us correlation and don’t fully tell the story of how many wards you should buy. That sort of complex analysis is maybe a topic for another day. How do Trinkets fit into all of this? Most players sit on their unupgraded Warding Totem. Specifically, 73% of players end the game with a Warding Totem, 12% with a Sweeping Lens, and 5% with one of the other five options. Let’s condense the basic Trinkets and their various upgrades into three classes: Orb, Lens, and Totem. 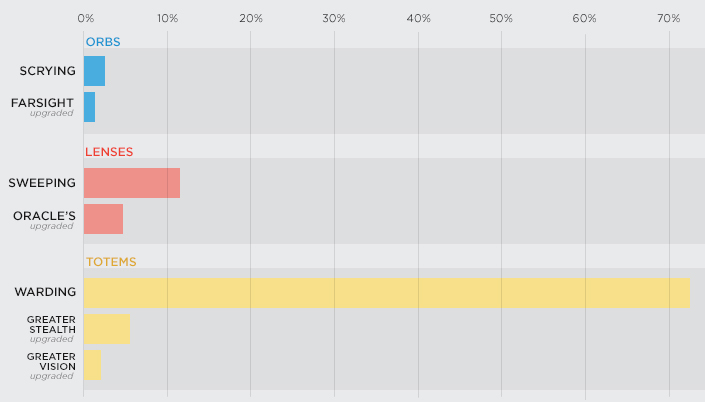 From there, we can more easily see trends across different roles and levels of play. 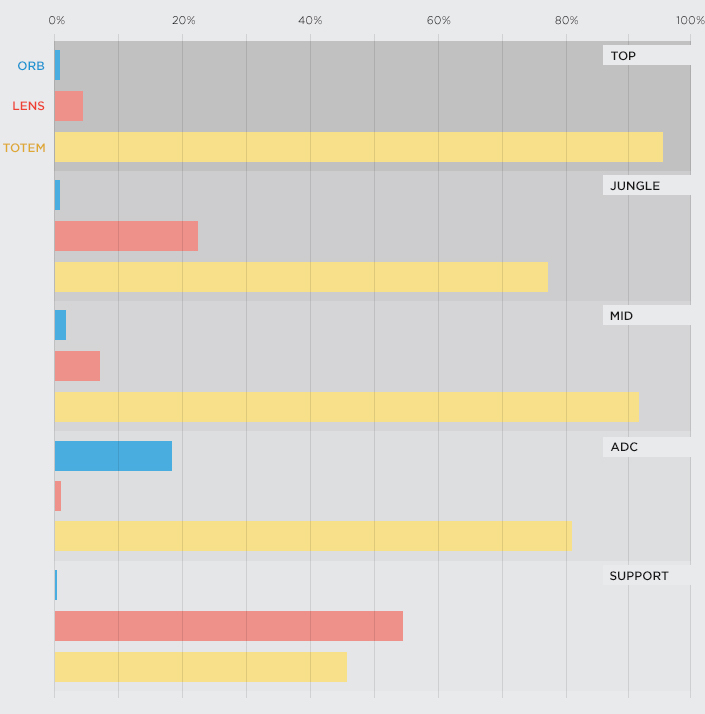 Totem is the Trinket of choice for all roles except Support, who favor Lens 54% of the time. Junglers are second mostly likely to have Lens, picking it up in 22% of games. Orb, being a more niche, situational choice, doesn’t get the same amount of love. Only among ADCs does Orb show up a significant amount of the time, but still only in 18% of games. Totem remains dominant in most levels of play, including 91% of games in Bronze and 50% in Diamond. Usage rates of Lens and Orb both gradually increase as you climb the ladder, with Lens overtaking Totem in Master+ tier games. Lens sees more action in these high skill games, in part, because players at this level are warding at a much higher rate. It only makes sense to buy a broom if you’ve got something to sweep! If you want to up your vision game, start out small. It can be tough to get into the habit of buying wards, but take our advice: If you want to up your vision game, start out small. Grab an extra Stealth Ward on your first back; you’ll thank yourself for spending 75 gold when you see the enemy Jungler coming. Get a Vision Ward out early and don’t get buyer’s remorse if it gets cleared. And don’t forget to upgrade your trinket; yes, it’s probably better than that fourth Long Sword. You’ll be going above and beyond most players.